Possibly THE best beauty advent calendar of 2018 is the ELLE Luxury Beauty Advent Calendar. This is ELLE's debut Advent Calendar. There are 24 products, of which SIX are full-sized. Best of all? The brands and the products. Lots of new things in here. No Eve Lom cleanser. No Omorovicza mist. No Lipstick Queen mini. Different products, from different brands. There's an Hourglass Ambient Lighting Powder. A Dr Dennis Gross Vitamin C serum. A month's membership to Beauty Pie. A NailsINC polish. You had me at no Eve Lom cleanser. Honestly! The calendar costs £125, and is worth more than £340. It is designed by Richard Quinn, in an exclusive print. The curator is Elle's beauty director Sophie Beresiner. I have a nasty feeling this one will not only sell out immediately, but also cross the £200 price-mark next year. The ELLE Beauty Advent Calendar 2018 is available HERE on preorder. £125, worth £340+. Scroll down for the contents and spoilers of the ELLE Luxury Beauty Advent Calendar 2018, and a 10% discount code. I just told you about the exclusive design. Sadly, this one DOES have those pesky flip-open "doors" that destroy your nails until Crimbo, so be warned. Maybe they'll do drawers next year. Pun unintended. LOOK at those brands and products! You had me at Hourglass Dim Light. I want them ALL! Normally, there is an average ratio of 14:10 for advent calendars that I decide to buy (products I can use vs products I don't really want). If it is any less, I decide not to buy. In this case? 21:3! I'm not fond of the fake tan. Benefit Gimme Brow might be the wrong shade for me. I also have too many Orgasms (PUN UNINTENDED). Apart from these three, I'll use everything. That's incredibly rare. 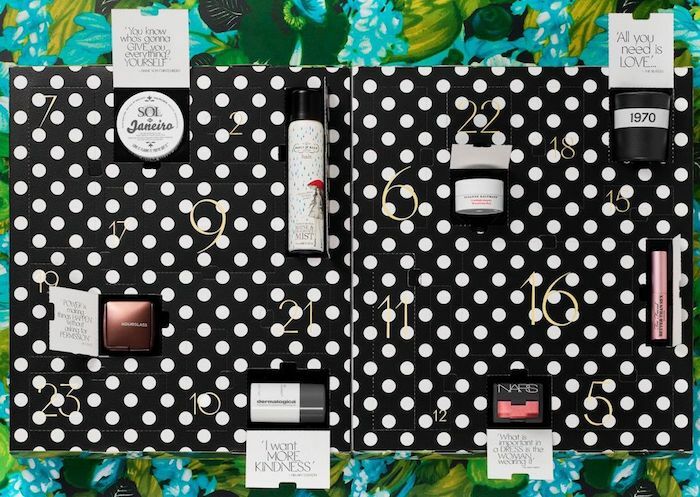 And, this selection of products - not in usual advent calendars, beauty boxes, and GWPs - is what sets the ELLE Beauty Advent Calendar 2018 apart, and makes me term it the "beauty advent calendar of the year". Yes, you can quote me on that. The ELLE Beauty Advent Calendar 2018 is available HERE on preorder. £125, worth £340+. Code TREATYOURSELF gets you 10% OFF! What more can you ask for? OR, if you prefer ordering directly from Hearst - no discount, but they ship outside of the UK - go here.